Well, it’s that time of the year again folks. That great time where you find yourself bombarded with varieties of them every time you leave the grocery store. That time when you scrape together your pocket change to try to gather up enough or totally run as you leave the store to avoid their smiling faces. That’s right – it’s Girl Scout Cookie Season. The one time a year when we actually pay $3.50 for a box of cookies that often times contain as few as 12 very small cookies. Even though I do not like the fact that the cookies are $3.50 a box, that you receive less every year or that the size of the cookies decrease every year, we still purchase a great amount of these cookies. There are 3 Girl Scout Cookies that I like – Tagalongs, Thin Mints and Trefoils. While it may take me a while to try all of them, I did decide to open a box of Thin Mints last night and test run them. For the pure sake of this blog of course. 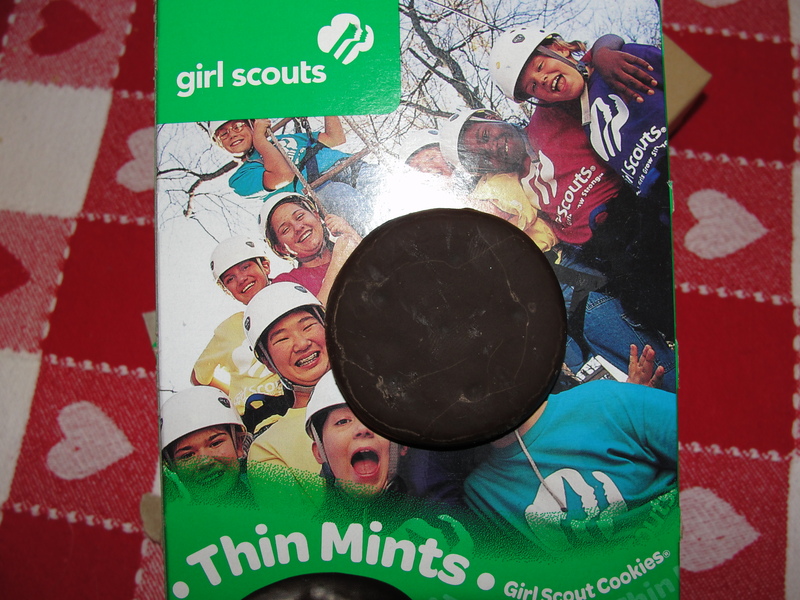 Thin Mints are the most popular Girl Scout Cookie and described as, “Thin, mint-flavored chocolate wafers dipped in a chocolate coating.” I didn’t have any Girl Scout Cookies at all last year so it has been a while since I have had these. 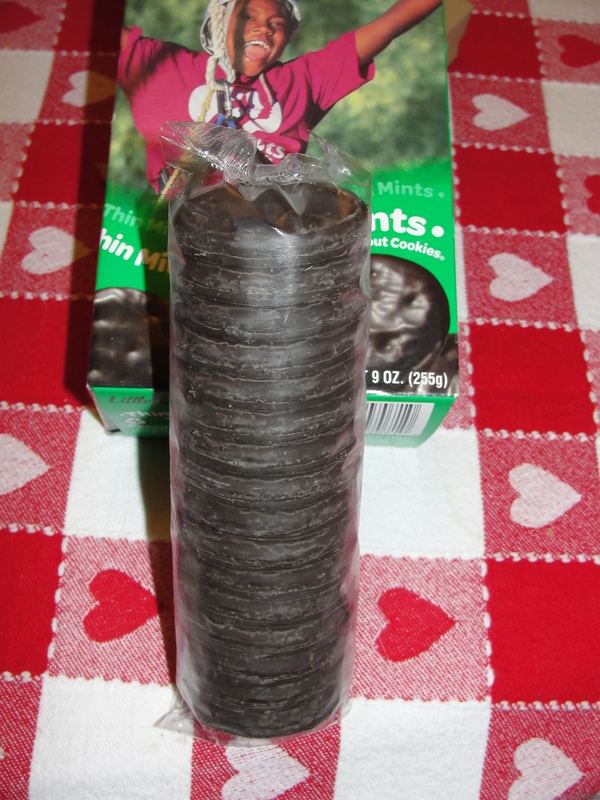 The first thing I noticed is that these Thin Mints seemed way thinner than I last recall. I grabbed 4 from the box (a servings worth) and looked them over. They were certainly much smaller. 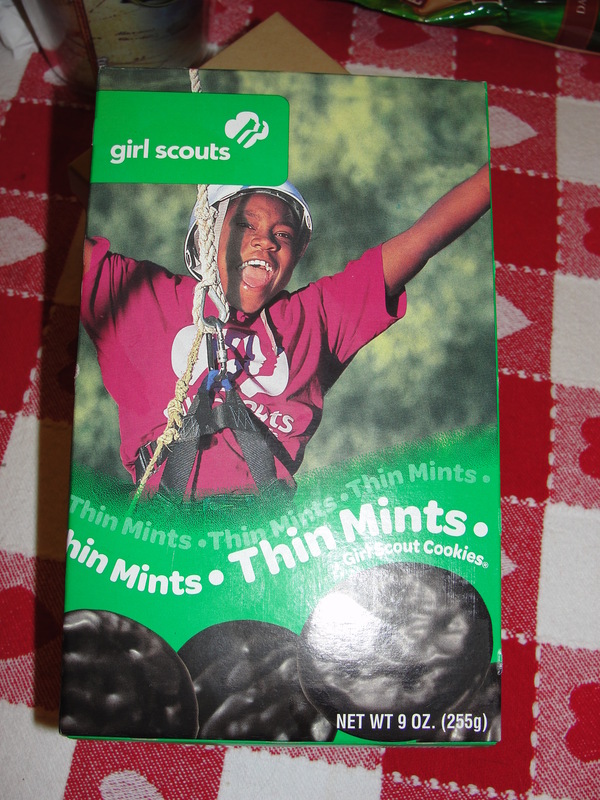 Did they change the name to Thinning Mints and forget to update the box? We keep our Thin Mints in the refrigerator so my cookies were nice and cold. They still put out a strong aroma of mint and chocolate and they looked very yummy. Even though the cookies could be easily consumed in one bite, I bit into my first cookie. 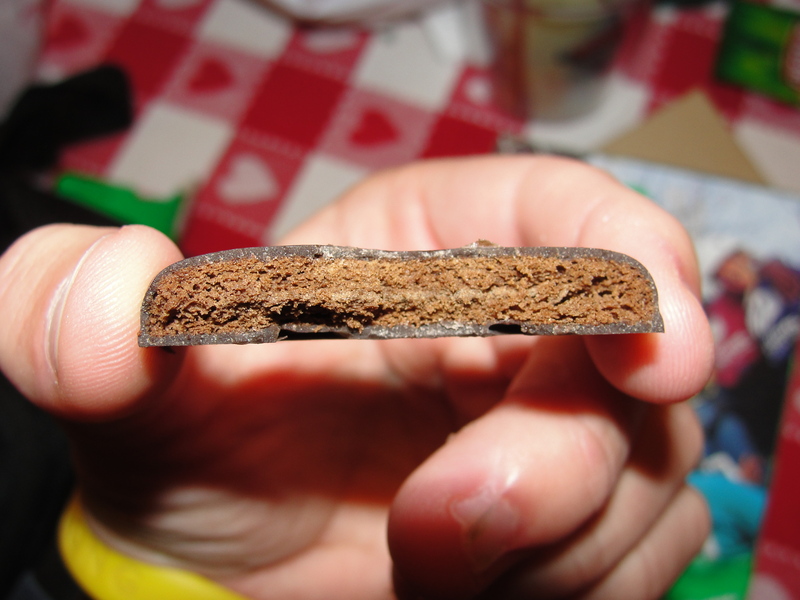 I found the chocolate wafer to be very crisp and tasty. As I chewed my bite, the chocolate wafer mixed with the chocolate dipping and the mint could be tasted while chewing and when I swallowed. My next cookie, I ate the entire thing at once. This was much better. The cookie was much more crispy in taste and the mint was much more apparent. While the chocolate is by far not a strong chocolate taste, the flavor is there and it really does mesh well with the mint. My mouth felt very refreshed after I had chewed and swallowed the cookie. Every bite was equally as good and the thinness of the cookie makes for a not-so-big mouthful. 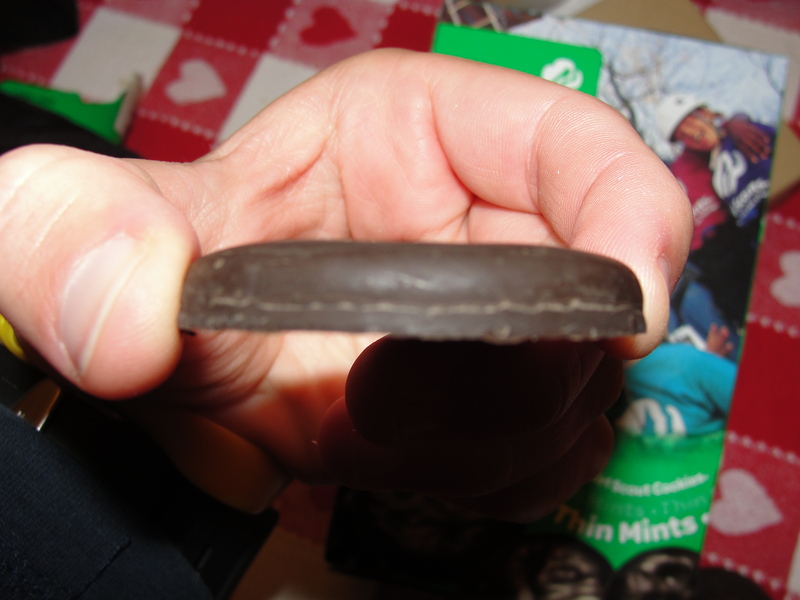 The Girl Scouts win on these Thin Mints with the consistency factor. Every cookie is just as good as the next. I feel as if the wafer in one cookie is indistinguishable from the next cookie. The same goes for the amount of chocolate dipping on each cookie. Each and every cookie tastes good and this is the case in every box that you purchase. This may not sound like a big deal but, to me it really is. If you are going to spend $3.50 on one box of cookies, you want to be sure they are worth it. After eating my 4 cookies, I felt satisfied. I did not have any desire to go into the box and grab tons more and eat them until they were empty. Now, I’m sure there are a lot of people who do just that but I just don’t feel that attraction to Thin Mints. The Thin Mints were crispy, minty and just enough for an after dinner treat. There really isn’t too much else to say about them. If you are in the mood for a tasty (and expensive) treat, grab yourself some before they are all gone. If you miss out, you will have to wait an entire year to try these Thinning Mints – and there is no telling just how Thin they may be.